In recent years there has been an increase in people coming to faith, yet the impact on society seems to have been minimal. What is really happening? David Eby presents a persuasive, and yet gentle rebuke to the church for paying more attention to marketing in church growth than to preaching. 192 pages, from Mentor. - Publisher What does God really bless in church growth - how can we redevelop the role of preaching so that it is central to evangelism and still be effective? 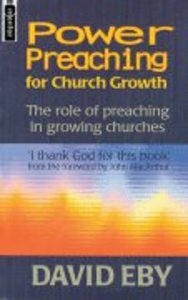 About "Power Preaching For Church Growth"
What does God really bless in church growth - how can we redevelop the role of preaching so that it is central to evangelism and still be effective? David Eby is the pastor of North City Presbyterian Church in San Diego. He has studied hundreds of volumes of literature of the Church growth movement, is committed to the goal of church growth, and leads the lively ministry team of a growing church in California. he is the author of Power Preaching for Church Growth: The role of Preaching for church growth.